The other day I had the opportunity to be pageant judge. That’s right a beauty, I mean scholarship, pageant. My friend Lizzie asked our mutual friend Terra and me if we would be interested in the gig. 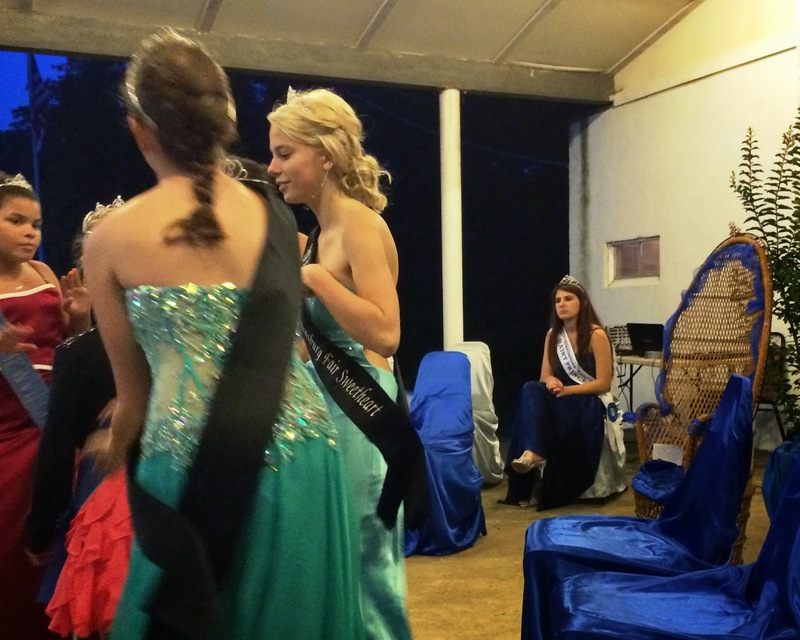 Judging a pageant is a doofus hipster-wannabe blogger’s dream come true. We both jumped at the chance, and so put the Cumberland Ag Expo on our dance cards. In case you were wondering, I have excellent qualifications in the pageant judging department. I watched the Miss America Pageant on TV about 30 years ago. I’ve seen both The Bachelor and The Bachelorette at least once, and watched a few seasons of Project Runway. And last but not least, I’ve scoped out a million people in bars, some of whom were actual women. To get to the expo, you drove about 75 miles from State College into deepest, darkest, farm-y-ist, Pennsylvania. We were well past the point where people can spell in English. While the drive was beautiful, I thought for a moment or two that I was going to have to change the voice on the GPS to the Sacagawea setting. 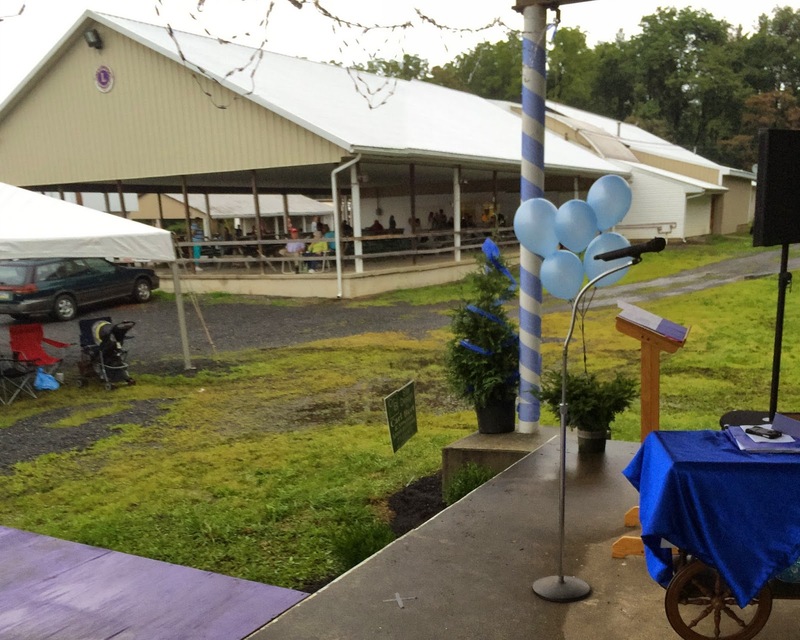 The Cumberland Ag Expo is one of the 109 county and community fairs in Pennsylvania. I learned this factoid from my colleague on the judging panel, Michelle, who works in the county fair office (big shock, there is one) in the state government in Harrisburg. I didn’t ask her if she makes the state regulations regarding what people can or can’t deep fry at a fair, but my guess is that’s she’s probably in on the ground floor of that deal. My default county fair is the Centre County Grange Fair and Encampment which takes place each year in late August. It’s a great honkin’ thing with a midway, farm animals, exhibits, commercial booths, big time entertainment, and of course, its trademark camping in tents and campers. It’s sort of like the all-white middle-class slightly-redneck version of Woodstock, only without the bad hair, bell bottoms, drugs, booze, mud, and Janis Joplin. I wasn’t expecting the Cumberland Ag Expo to be quite like that, but more like its fetching country cousin, the Perry County Fair, which has most of the things the Grange Fair has, only in the smaller, cuter, and less deep-fried version. The Cumberland Ag Expo fair was somewhat—ok, lots—smaller than those two fairs. There are several ways to judge the size of county fairs. You can look at the size of the fairgrounds, the number of exhibits, or even audience numbers. I, however, use the industry standard metric: the number of funnel cake trailers. The Cumberland Ag Expo had just one. 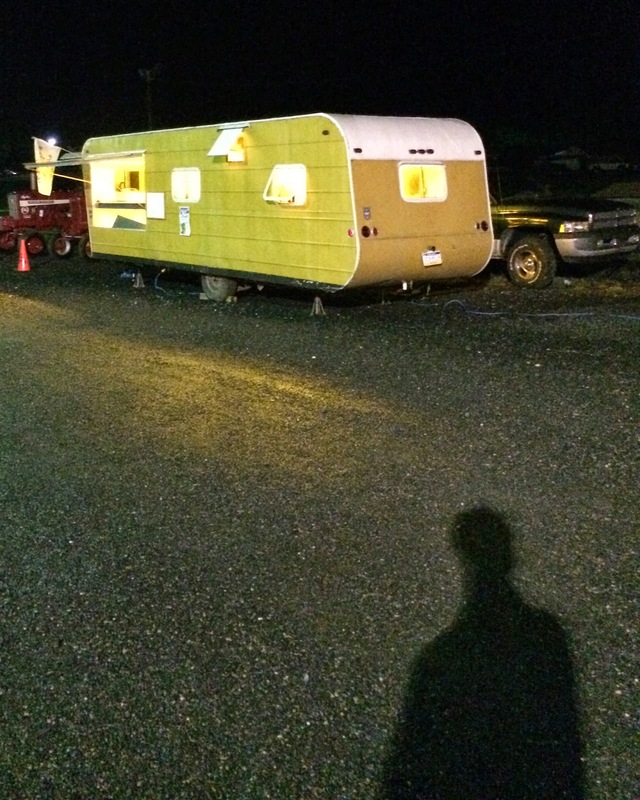 And it wasn’t the standard white metal and glass concessionaire’s trailer. This one looked like a repurposed 1940s film noir-esque house trailer. It was the kind of place where you pray that the semi-hot farm boy who picked you up at the bar doesn’t live. There were a handful of buildings on the fairgrounds, all built in the non-quaint local vernacular materials of metal and concrete block. While functional, no one would ever call them architectural gems. Since it had been unusually rainy, the grounds were green and muddy. Our gig was on the opening day of the event, so the expo hadn’t really hit its stride in terms of audience numbers. There was a smattering of cars I the parking lot. And I do mean a smattering.When we pulled into the parking lot I thought all the cars must belong to people working there. There wasn’t a midway, so I wouldn’t be able to do a star turn at a cotton candy stand—a skill I picked up at the Reedsville Fireman’s Carnival. There weren’t barns filled with freshly scrubbed farm animals, so there was no danger my of lapsing into a reverie about life as a gentleman farmer with a herd of polled Herefords grazing in the distance creating Tumblr-worthy photo ops. There were no commercial vendors, so I was spared the chance of walking by the booth of the local Rock of Ages dealer and seeing a Polaroid of a headstone belonging to a dead person who just happened to be my father. The exhibit building was starting to fill with things. There were the standard fresh cabbages and beets as well as beans and canned meat (ugh). There was even a display of canned lard. That’s right, canned lard. I asked a woman how they judged the stuff other than by looks and she said she was just arranging the jars and didn’t know anything about that. While she didn’t provide much info, she was doing a top notice job of arranging the jars of canned goods. If any readers know how about judging canned lard, please contact me, I’m dying to know. After a dinner of fair fare (hot sausage sandwich and french fries) it was time to wander to over to the stage for the pageant. Terra and I met the other judge—the previously mentioned lovely woman from the county fair office in the state government—and heard our very complicated instructions. Seriously, the launch sequence for an inter-continental ballistic missile can’t be as complicated as the process of completing those score sheets. We were to judge the young women on a variety of criteria including Poise, Personality, Communication, Appearance, and Answer to Question—I was so hoping they’d ask the contestants if they were in favor of world peace! Before things got underway officially, my fellow judges and I had a quick chat with the four contestants. That’s right, four. One for each prize. The women were very nice, quite attractive, and couldn't have been more polite. But they were also evidence of the sorry state of teaching English grammar in schools. My mother, the grammarian, would have disqualified all of the contestants since, to a woman, they all were significantly lacking in the standard English department. The pageant started late and the first order of business was the presentation of a giant check from the state fair office to the fair organizers. Every time I see a giant check presentation I wish someone would show up with a giant deposit slip. Hasn’t happened yet, but hope springs eternal. After giant check business was over, the contestants came on stage in casual clothes and introduced themselves to the audience. Each young woman gave a little speech about what she liked about living in Cumberland County. Then there was a break in the action while the contestants changed into evening wear. The pageant emcee and his wife used this opportunity to provide a “musical interlude” backed up by keyboard and steel drum. The other visiting agri-royalty, the Newville Fair Queen, the Newville Fair Sweethart, the Cumberland Dairy Princess, and the Pennsylvania Pickled Beet and Egg Dowager Countess took the opportunity to do some impromptu dance numbers, presumably to demonstrate that they, too, were gifted when it came to Poise and Appearance. Interestingly enough, after about 30 seconds of that tomfoolery, the Dairy Princess channeled her inner Queen Victoria and sat back down with that We Are Not Amused look on her face while the lesser royals cavorted. After I Will Survive was beaten to death, the contestants came back onstage and walked about in their evening gowns demonstrating their poise and appearance not to mention their ability to pick out an evening gown. 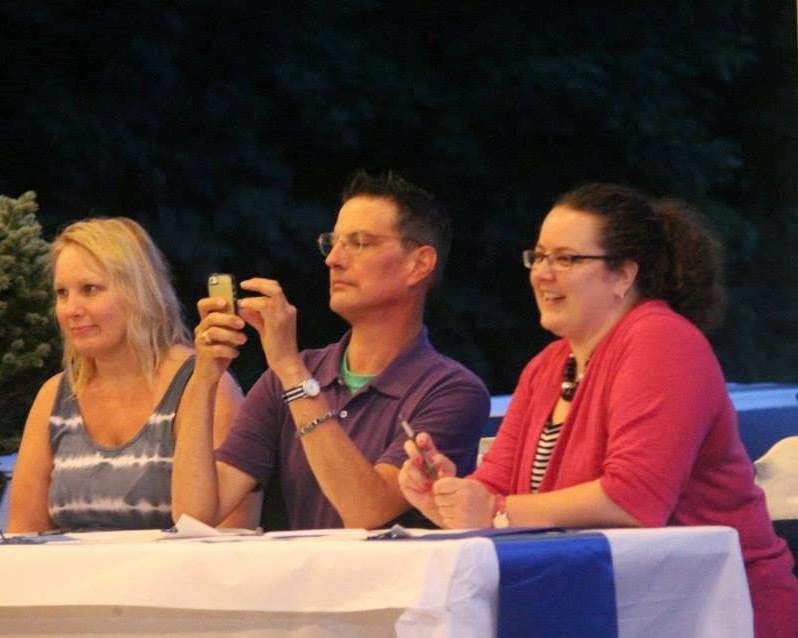 My fellow judges and I got down to the hard work of voting two off the island. It was much more difficult than I thought it would be since each young woman had strengths and weaknesses. The emcee delivered the bad news as both young women put on brave faces while accepting their consolation bouquets. We were finally down to the final two and the old Ask Each Contestant a Question While the Rest Wait in a Soundproof Booth portion of the evening. Only in this case, it was a soundproof concrete block room that passed for backstage. 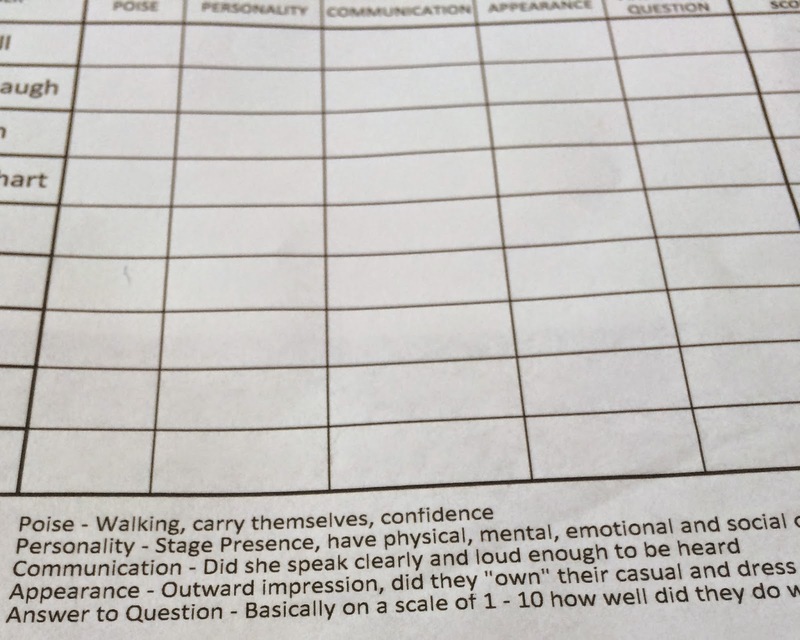 The pageant committee had decided to ask each woman about childhood memories, so I never did learn if they were actually in favor of world peace. I'm hoping so. After both speeches, my fellow judges put our heads together and came to consensus on our choices for the first runner up and the winner. I completed the official score sheet and handed it to the emcee. And then he read the wrong name. The technical term for that in pageant land is EPIC FAIL. After a few seconds, he did a one-eighty and announced that the real winner was really Hetty Lynch and not Paige Ezell. Yikes. It was quite something indeed. Paige, the first runner up, was incredibly gracious about the snafu. I’m not sure that I would have been, especially if I’d been wearing a high heels and evening gown in a beauty pageant all evening. Hetty, the winner, was magnanimous in victory and greeted her subjects just as all pageant winners do—with tears of joy. About two seconds after the end of the pageant, while the stage was still filled with photographers, the expo committee started the baked goods auction, something they didn’t do when I watched the Miss America Pageant on TV 30 years ago. Terra didn’t think the contestant saw her and didn't find out why the contestant was upset. Perhaps her pineapple upside down cake didn’t fetch the price in the bake sale that it should have? Or perhaps she left her entry of canned lard at home? Or perhaps she was just a sore loser, or as Shakespeare might have said, that unhappy lies the head that doesn’t wear the crown. P.S. Because of the emcee's goof in announcing the names of the prize winners, the pageant's organizers did their best to make amends by giving Paige the same scholarship that they awarded Hetty. She might not have won, but she'll have a story she can dine out on for the rest of her life. How fun is this! I'm sending this to one of my best friends who is from Cumberland -he might already know all about it. I'd be delighted to suggest him as a judge for next year!